If you are looking for a good snack on the way to somewhere, or just wanna relax a bit from your busy day, Aroma can be a nice place for that. With more than 20 branches in the city you'll definitely hit one on your way. 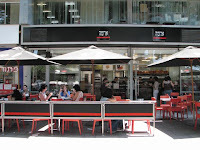 Their menu has different kinds of sandwiches, salads, coffee and other drinks, all very good in quality and amount. The prices of the sandwiches are relatively high, but it gets a little bit cheaper if you order your meal to take out. The salads are a good bargain, especially the "Israeli salad" and the Tuna salad, which are served with two slices of bread and butter (you can add chicken or Halloumi cheese too if you like). Aroma specialty is the "Ice Aroma" - sweet ice coffee latte (you can also order it in the chocolate version) which is a nice refreshment in the middle of a hot day. Just look for the Aroma sign and you will stumble across one crowded intersection in the city.